The sleek design of the Tottenham fireplace adds a touch of sophistication to virtually any room. With clean lines and distinct styling, this versatile mantle can be “dressed up” to serve as a focal point of a room or treated more subtly as 1 element in overall room design.Shown in walnut finish. 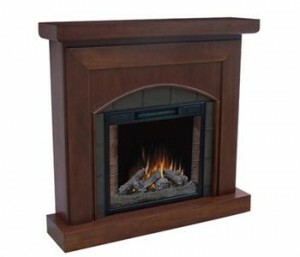 Along with the overall appearance of the mantle, the firebox insert also has several important features that will be sure to enhance your enjoyment of this product. Add accent lighting to the front of your mantel with the flick of a switch. The soft ambient light adds a romantic mood to any dark room. One benefit of an electric fireplace is that it can mimich the look of a wood or gas fireplace much more simply and cost effectively. We have taken this into account and designed the product to hide the controls to remove that “electric” look from our firebox inserts. Injection moulded handles are recessed in to the side of the firebox insert to allow for easy lifting and moving of the insert into and out of the mantle. This full function remote control allows you to turn the firebox insert on or off, adjust the flame intensity up or down, and turn the heat on or off. The ambiance and heat of your fireplace are now accessible at the touch of a button. The heater portion of the firebox insert can be set to either a “high” or “low” setting. The adjustable thermostat allows you to maintain a consistent room temperature by cycling the heat on and off as needed. This allows you to set the temperature to a desired level and also saves on energy costs as the heater is not operating all of the time. Even when the heater cycles “off”, the fan will continue to circulate air in the room. Adjustable thermostat allows the heater to cycle on/off to maintain comfortable room temperature. It is a free standing unit can be placed against any flat wall. For the Phoenix fireplace you need to register for the warranty. Click here to Register your Phoenix Fireplace.